To put it in context, A Jolly Christmas was bookended by A Swingin’ Affair! (a sterling Nelson Riddle set) and Come Fly With Me (a masterpiece with Billy May). And released in exactly the same month (September of 1957) was Where Are You? , one of Sinatra’s great sets of lovelorn ballads, this one arranged by Gordon Jenkins, who likewise is the arranger for A Jolly Christmas. 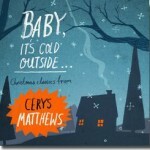 Jenkins had his strengths and weaknesses as an arranger, but there’s no doubting that his particular style is crucial in making A Jolly Christmas the unique kind of Christmas record that it is. On A Jolly Christmas, Sinatra and Jenkins create and hold a very particular mood, quite distant from that of the average Yuletide platter. When listening to this album the overwhelming image evoked in my mind is that of Frank Sinatra, alone, maybe at a window of his apartment, singing his songs into the crisp, dark night. (“It Came Upon a Midnight Clear”, you might even say.) There are those backing singers, of-course, but they seem a little bit distant and somewhat unreal, as if they might only be singing in Sinatra’s head, where the orchestra is also gently playing. 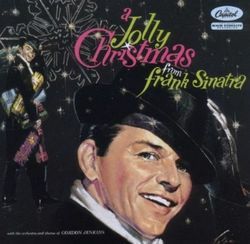 We are hearing the accompaniment that Frank is hearing, but it somehow seems like it’s just a single man, alone, delivering a kind of tribute to Christmas into the nighttime air. And I think that’s a quite lovely substitute, a kind of subtle entreaty to keep one’s chin up, and actually the rewritten version became more popular with singers and listeners. In fact, both the original and rewritten lines are good in their own way, and some singers include both these days, simply singing that verse twice and alternating. But again it shows Sinatra’s unshakeable focus at this point on keeping a certain mood; “until then we’ll have to muddle through” set off some kind of internal Frank alarm, apparently. It was heading too much into the crying-in-your-whiskey area, which he was quite happy to do at other times, but to everything its proper place. He could have simply picked another song, but Martin came through with the rewrite, and the rest is musical history. When it came to side two, and the hymns, there was surely some risk of it all coming across as incongruous or even cynical. This was still the 1950s, after all. 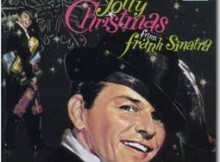 Frank Sinatra, unlike Bing Crosby, did not have a Fr. O’Malley persona he could don at will. Any halo he may once have worn went away for good when he divorced his first wife, Nancy Barbato, in 1950, after a well-publicized affair with Ava Gardner. He then wedded Gardner, but their marriage was rather the opposite of a model of love and faithfulness, and in fact their own divorce was finalized in the same year this Christmas album was released. But again, if you ask me, the magic of mood creation saves the day. One of Sinatra’s greatest gifts was his ability to get deeply inside a lyric and then express it in his singing seemingly without effort. He paid very close attention to words. He would have been very aware, then, that songs like “Hark! The Herald Angels Sing” and “O Little Town of Bethlehem” are indeed solemn hymns, not just holiday chestnuts. They were written to be sung in churches, and they include words and thoughts and feelings of deep spiritual import. Sure, you can belt them out like “Rudolph the Red-Nosed Reindeer” if you want, but you will not be giving them the treatment they deserve. Frank Sinatra at his best always gave songs the treatment they deserved (except when he gave them treatment far beyond what they had previously seemed to deserve). In this case, Frank seems to carefully take note of the hallowed ground on which he is stepping with these songs, and he sings them with a marked humility underlying their joy; in other words, he sings them like any poor sinner should. Listening to him perform these Christmas hymns, my mental image shifts slightly. 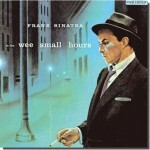 Sinatra has left the apartment where he lives alone (it is now perhaps 1:00 a.m.) and he has wandered into a small, abandoned church. It is very dark. He looks up and maybe he sees, through the empty space where a window once was, the light of a small twinkling star. He sings these Christmas hymns into the night, with reverence and a bit of what we used to call “fear of God.” The backing singers in his head are revealed as an angelic choir. Lest I go overboard here, I think he screws up with “Adeste Fideles.” It’s a little strained, a bit pompous; if he couldn’t fix that with the performance then he should have gone with a different tune. 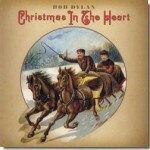 The album ends rightly with a moving “Silent Night,” and there it is. Sinatra, in my mind’s eye, goes home, alone, but not necessarily lonely; he pours himself a drink and smiles. Christmas is a wonderful thing, even if one is standing aside and mostly just watching other people celebrate it. Like Sinatra’s other albums of the period, it does something of an injustice to this one to break it up and separate tracks out. It’s meant to be listened to in its entirety at a single sitting. That makes it a rare Christmas album indeed. Whether you are alone or not this year, by choice or unavoidable circumstance, may you have a jolly Christmas.